It was at Shock Stock last weekend that Fangoria editor Chris Alexander let me know some wonderful news - the article I turned into him a few months ago had been published in the latest issue of Delirium! For those who don't know, Delirium magazine is a labour of love started by Alexander to explore the vast empire of genre icon Charles Band. 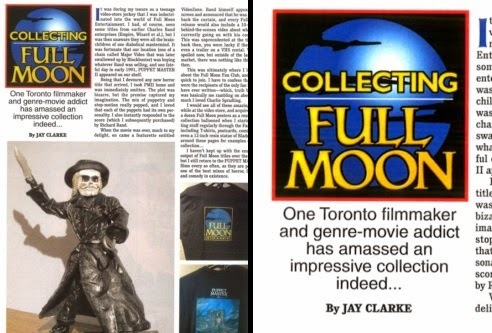 Some time ago, while engaged in a discussion about Full Moon collectibles on Facebook, I linked to one of my Archives posts. I guess it caught his attention, as Alexander then asked if I would write a piece about my collection. Since I had no shortage of stuff to offer, I was happy to oblige. I just had no idea he'd turned it around so fast! It's pretty awesome seeing your name in a horror mag. I mean, I've had letters printed over the years, but being an honest-to-goodness contributor is pretty darn neat. To get more information about Delirium, click here. I've read the first three issues so far and they're good reads; funny, lurid and informative in equal measure.